For work that leads you into unexpected situations, the Danner Acadia Steel Toe will be one rock-solid element you can always lean on. Made in the USA, the Acadia features Danner's high quality, hand-crafted stitchdown construction to provide a stable and ultra-durable platform underfoot. This construction also means these boots are recraftable in Danner's Portland, OR factory. These boots are fully waterproof yet breathable, thanks to a combination of GORE-TEX® lining. The uppers are made of a combination of 1000 Denier nylon and full-grain leather. The leather keeps these boots easy to polish to look your best, while the Denier nylon is resistant to abrasions, scuffs, and tears, while improving breathability and drying quickly. Keep those toes safe with a steel toe that meets or exceeds ASTM F2413-11 M I/75 C/75 EH. Count on the Vibram® Kletterlift to provide an outsole that provides excellent shock absorption with each step, and superior traction on both wet and dry surfaces. American craftsmanship and safety/comfort features that just won't quit, the Danner Acadia Steel Toe 22500 is sure to be the ultimate accessory for your high-demand job. At one time not long ago if you wanted footwear support you added heavyweight materials. 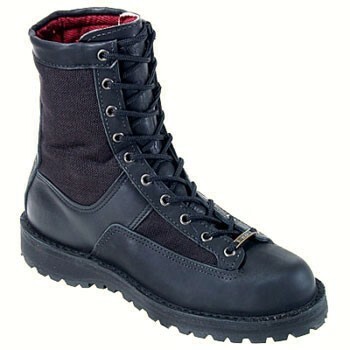 Danner has changed all that by providing exceptional support utilizing super lightweight technology.